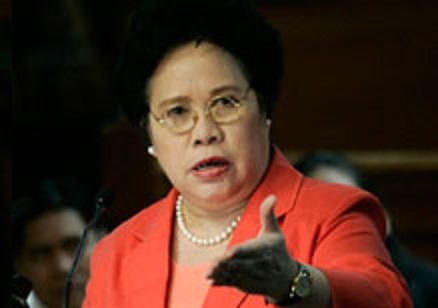 MANILA, Philippines — Senator Miriam Defensor-Santiago warned on Sunday that injuries sustained by overseas Filipino workers (OFWs) from Taiwanese attackers could be considered “an act of aggression” that could serve as basis for the fold-up of the Manila Economic and Cultural Office (MECO) in Taipei. “The 87,000 overseas Filipinos in Taiwan had no hand in the death of the Taiwanese fisherman allegedly shot by the Philippine Coast Guard (PCG). If the victim were a Filipino, I don’t think the Taiwanese also want this sort of retaliation,” Santiago said in Filipino. The senator repeated earlier observations that Taiwan President Ma Ying-jeou could be using the incident that occurred last week in the waters off Balintang Island north of the Philippines to distract from domestic problems occurring in his country. “Their president has become unpopular but he should not use this incident as a distraction just so the hostility meant for him is deflected to us, as he seems not to know how to run his country,” Santiago noted in Filipino. The senator lamented how Taiwan officials seemed not to make an effort to protect the OFWs. There have been reports of Filipinos being refused service in stores and restaurants and that one was even mauled with iron pipes following reports of the death of fisherman Hung Shih-cheng. “From the point of view of international law, the (hostile acts against Filipinos) is already an act of aggression. Also, there is already a fact-finding effort. Let us first establish whether they violated our baseline law,” Santiago said. Under this law, the Philippine baseline stretches up to 12 nautical miles from the coastline. “Foreigners can only claim the right of innocent passage. Now, if the Taiwanese fishermen admit they were fishing…,” Santiago trailed off. The senator cited Philippine laws allowing the PCG “to stop suspicious persons” from entering the country’s waters. Santiago, a member of the Senate foreign relations committee, also lamented what she believed to be a display of “bad faith” by Taiwan when its officials unilaterally joined Philippine authorities investigating Hung’s death. “The (Taiwanese officials) were not invited and they even brought the entire Taiwan media. It cannot be helped if one suspects the effort was for black propaganda. That is not friendly behavior,” she complained. Santiago warned that further acts of provocation could force Philippine authorities to rethink whether the MECO should remain in Taipei. “Under the One China policy, there are only 23 countries that recognize Taiwan as a separate country. The rest identifies Taiwan as a province. If Taiwan continues to make us a scapegoat for its domestic political problems, we should start thinking carefully… maybe we can just withdraw our office there,” she said. She also said suggestions to repatriate arbitrarily the 87,000 OFWs would be considered a violation of their human rights. “Why, that would be like the Holocaust, like Nazi Germany where the innocent is meted harsh punishment when it is so obvious that their president is only engaging in political posturing,” Santiago huffed. Senator Francis Escudero blamed the “diplomatic complications arising from the One China policy” for worsening the rift between the Philippines and Taiwan. “The situation is unique, and it requires a unique approach. But whatever it is, it will have to be decisive and it has to come soon. The issue is an emotional one, and situations like this can change from bad to worse in the blink of an eye,” he said in a statement. Escudero pushed for a formal inquiry into the shooting of Hung. “The family of the slain Taiwanese fisherman deserves no less,” he said. “The only way to diffuse the situation is to convince the Taiwanese government that we are pursuing the path of justice earnestly. We should find out what happened, and what led to the unfortunate slaying of the fisherman. And then let’s move on from there,” he said. So far, Taipei had rejected the apology issued by Philippine Representative to Taiwan Antonio I. Basilio over the fatal shooting. Taiwanese President Ma claimed the statement of apology failed to satisfy the demands of his government and ordered a freeze on applications by Filipino laborers to work in Taiwan. He also recalled the Taiwanese representative in Manila and requested the Philippine representative in Taiwan to return to Manila.